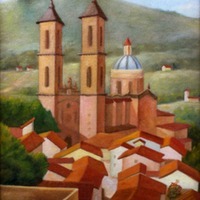 Bell Towers, an oil painting created by William "Bill" Sterling Jenkins in 1941. 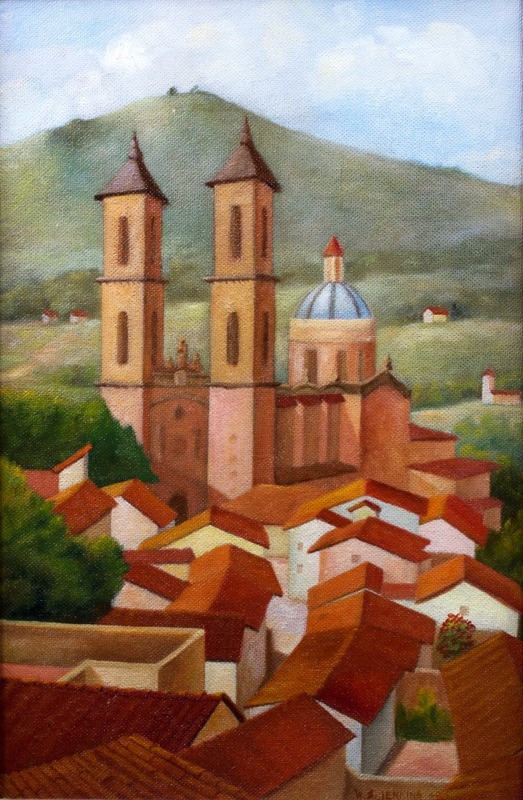 The painting depicts the small town of Taxco de Alarcón in Mexico. Jenkins received his Bachelor of Fine Arts in 1934 from the University of Florida and was awarded a postgraduate scholarship to study art at the Royal Academy of Fine Arts in Florence, Italy. He spent several intensive years traveling through Europe by rail and bicycle, creating figure and landscape paintings. Upon his return, he established an art school in Columbus, Georgia. In 1942, he married Alice Moberg after meeting her in Mexico, where he studied silversmithing. Following a brief stint in the U.S. Army, Jenkins received an honorable discharge after contracting pneumonia and was sent to the Veterans Administration hospital in Orlando, Florida, to recuperate. He then worked for the VA and pioneered a program of rehabilitative art therapy classes for veterans. After earning his master’s degree in psychology from Florida State University in 1950, he settled in Winter Park and established Jenkins Construction Company, building many residential communities and shopping centers. In 1975, Jenkins established Crealdé School of Art, donating the organization and the property to the community in 1990. He also established the Jenkins Chair at the University of Central Florida, and donated the majority of his paintings to the UCF Art Gallery. Original 26.5 x 18.5 inch oil painting: Jenkins, Bill. Bell Towers, 1941: Private Collection of the Jenkins Family. Digital reproduction of original 26.5 x 18.5 inch oil painting: Jenkins, Bill. Bell Towers, 1941. Private Collection of the Jenkins Family. Originally created by Bill Sterling Jenkins. Copyright to this resource is held by Bill Sterling Jenkins and is provided here by RICHES of Central Florida for educational purposes only. "William Jenkins (1910-1996): Founder of Crealde School of Art." Olin Library, Rollins College. http://lib.rollins.edu/olin/oldsite/archives/golden/jenkins.htm. Shields, Gerard. "Remembering Jenkins: A 'Cornerstone In Art Community': Businessman, Benefactor And Accomplished Painter William Sterling Jenkins Is Dead At 86. He Created The Crealde School Of Art In Winter Park." The Orlando Sentinel, April 1, 1996. http://articles.orlandosentinel.com/1996-04-01/news/9603310506_1_jenkins-school-of-art-crealde-school. Jenkins, Bill Sterling. “Bell Towers by Bill Sterling Jenkins.” RICHES of Central Florida accessed April 26, 2019, https://richesmi.cah.ucf.edu/omeka/items/show/5386.